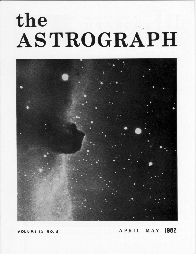 The ASTROGRAPH was a bi-monthly magazine devoted to astronomical photography. The last issure was published in June 2009 and was the June/July 2009 issue, Volume 40 issue # 6 (issue #s were 1-6). The ASTROGRAPH's format was 16 pages, size 8 1/2 by 11 inch. 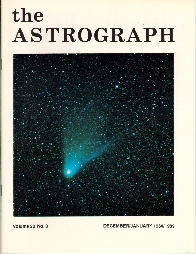 The ASTROGRAPH was published in printed format from August 1973 to November 2003. 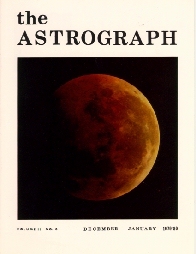 The ASTROGRAPH was published in Adobe Acrobat (PDF) format from December 2003 to June 2009.
the Printed back issue availability list.